Did you know that you can collect over a thousand gallons of water a year when you use rain barrels for rain water collection and storage? Barrels can typically hold anywhere from 50 – 80 gallons and for each inch of rains that falls on a 500-square foot roof, you can collect 3,000 gallons of water. In addition, when you harvest rainwater, it relieves aging sewer systems from the stress of heavy storms and lowers our water bills because it can be used to water your lawn, houseplants, and garden. 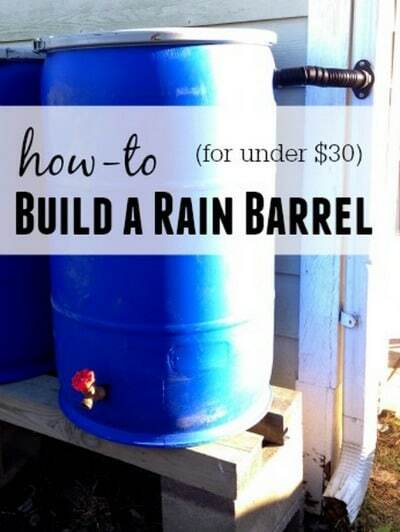 Rain barrels have the ability to positively benefit your home, garden, and community. For example, when you combine the use of rain barrels with appropriate plant selection and mulching, this promotes water conservation. Lawn and garden watering accounts for 40% of residential water use during the summer. However, when you use a rain barrel, you can save over 1,000 gallons of water during this season as it only takes half an inch of rain to fill a typical 50 – 55 gallon rain barrel. They are a free water source for irrigations and will help ease your reliance on the city’s water supply. Rain water does not contain the inorganic ions and fluoride compounds that are common in tap water so it’s better for use in your garden or on your lawn. Through times of drought or if watering restrictions are put in place, you can use the rainwater collected in the barrel to continue watering your garden and lawn. When preparing your rain barrels, it is important to keep a few tips in mind. Your rain barrel should include a screen to keep out debris and a cover to prevent mosquito breeding and algae build up. Water collected in rain barrels is not suitable for human consumption. When rain water is collected from the roofs of the houses, it picks up very little contamination when it falls. However, you must still make sure that your roof is free of debris and other contaminants.